Determined to impact young students' lives, more than three dozen students from Concordia University Wisconsin descended upon Northwest Lutheran School on Thursday to talk about goal-setting, college readiness, and the importance of striving for success in school. During the visit, Concordians helped students in each grade fill out vision boards, or poster boards where the class articulated goals they wanted to commit to as a whole in order to be successful in school. At the kindergarten level, students offered things like "be good" and "read", and at the middle school level, students suggested things like "show respect" and "focus." The CUW students' visit was part of what those involved at Concordia have dubbed a "school takeover." 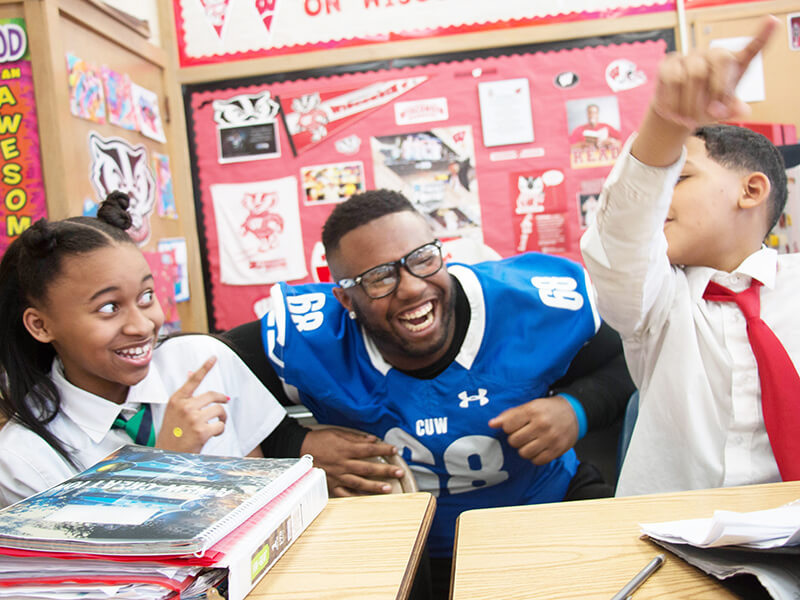 The Concordia group, led by Assistant Professor of Education Eugene Pitchford III, spent a full afternoon interacting with every student in the K-8 Milwaukee school. The effort took place in tandem with Concordia's Week of Service. The goal of the event: change at least one kid's life. It's the third school takeover CUW students have participated in this academic year and Pitchford says he's certain they're making good on their goal. Last month, during a different school takeover effort led by Pitchford, Professor Tracy Tuffey and Professor Lori Woodall, more than 75 CUW students spent a full day at HOPE Christian School: Fidelis. In addition to mentoring the K-8 students, the group delivered boxes of much-needed school supplies and gym supplies to the school. Students in Tuffey's psychology class took the lead on organizing the donations. The students solicited gifts from the community and even contributed some of their own money to the effort. When the HOPE students were asked to articulate in front of their classmates a goal they had set for themselves as a result of the day's experience, one middle school student was eager to share. "There was one kid who apologized for his behavior—for getting detentions and for not completing his homework," Pitchford recalls. "All of a sudden he started getting tears in his eyes and without saying a word, all of the Concordia students moved in to give him a group hug. Before we knew it, everyone was crying." Adds Pitchford: "There's nothing we can do that would be better than that moment." Afterwards, Concordia professors and students made a commitment to regularly check in with the student to let him know he's supported—an effort that continues today. In the month after their visit, the student's teacher says he's made a "huge turnaround." The visits benefit CUW students, too. Even though not all of the students who volunteer for the school takeovers are pursuing degrees in education, those who are interested in the field have the opportunity to gain extra practice in a classroom setting. The school takeovers also expose CUW teacher candidates to urban education settings, where quality teachers are continually in demand. CUW student Adrianna Covert, a freshman who is double majoring in secondary education and history, says she's seriously considering a future in urban education, thanks in part to the school takeover experiences. "I have been drawn to urban ed and having experience on the ground made me realize that these are the kids that I want to teach," Covert says. "There are so many negative stereotypes about the inner city and the people who live there, but the school takeovers are eye-openers because you can see firsthand how hungry for knowledge and passionate about life they are." Pitchford says he plans to continue organizing school takeovers next year. He already has several more schools in the Milwaukee area who have requested Concordia pay them a visit. "We're building pipelines for our students to teach in inner cities and for the younger students to come to Concordia," Pitchford says. "There are many kids who think that college is for someone else, but when they see these Concordia students who are close to them in age, they know it's real."